OMICS Group is pleased to announce the 2nd World Congress on Petrochemistry and Chemical Engineering during October 27-29, 2014 at Las Vegas, USA with a theme “Unlocking Energy through Innovation, Technology and Capability”. With the unique feedback and generous response received from the attendees of Petrochemistry-2013, OMICS Group proudly announces the commencement of “2nd World Congress on Petrochemistry and Chemical Engineering”. Petrochemistry-2014 has been designed to interconnect the latest technological advances in Petroleum Exploration. The important sessions that are part of the 2nd World Congress on Petrochemistry and Chemical Engineering includes Processing Technologies, Petroleum Exploration & Field Management, Drilling & Well Completions Challenges, Piping and vessel engineering & Transport Phenomena, Chemical Applications in Producing Oil and Gas, Coal and Natural Gas, Challenges and Safety in Petrochemical Industry, Energy Economics, Renewable Energy and Feedstock, Industry Issues, Chemical Reaction Engineering and its Applications, Production Technology and Separation Techniques, Modelling and Simulation, Catalysis Concepts, Reservoir Engineering. Several eminent scholars and researchers like Russell R. Chianelli, University of Texas at El Paso, USA, Davis Ford, Texas A&M University, USA, Grigoriy Sereda, University of South Dakota, USA, Hilkka Kenttamma, Purdue University, USA, Zhengdong Chen, Texas A&M University, USA, David Wu, Colorado School of Mines, USA, Wolfgang F. Hoelderich, Chemical Technology & Heterogeneous Catalysis, Germany, J. C. Jones, Kazakh-British Technical University, Kazakhstan, Chen Zhonghong, China University of petroleum, China, Ildenize Cunha, University of Campinas, Brazil, Van Nhu Nguyen, Institute of Energy & Climate Research, Germany, Vladimir Litvinenko, St-Petersburg university of Mines, Russia, and many more are going to be part of Petrochemistry-2014 as keynote speakers and presenters. Petrochemistry-2014 conference aims at gathering renowned scientists, Professors and Research professionals, Young researchers, Business delegates and Talented student communities across the globe under a single roof, where they discuss the research, achievements and advancements in bioenergy and Green Chemistry. These scientific meetings are crucial in disseminating and promulgating the advanced research initiatives. 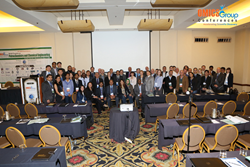 Petrochemistry-2014 also opens the door for organizing workshops during the conference as OMICS Group Conferences are well-known for organizing quality and full-fledged International Workshops. A session on current research topic Hydrocarbon software support and advancements is going to be discussed at Petrochemistry-2014 to widen the scope of research in Petroleum industry with the help of technology. Most of the poster presentations will be focusing on petrology and renewable energy and feedstock. Petrochemistry-2014 enable participants to acquire exceptional network, knowledge and introduce new technologies and techniques in the arena of enhanced oil recovery. OMICS Publishing Group serves scientific community through its 350 open access scholarly Journals and more than 150 international scientific conferences around the globe that facilitates the young researchers and scholars to interact with the world class experts in respective fields to evaluate their research through its Young Research Forum, Best Poster award competition and Student fellowship. The supporting journals of Petrochemistry-2014 conference are Journal of Petroleum & Environmental Biotechnology and Journal of Chemical Engineering & Process Technology. For more details about 2nd World Congress on Petrochemistry and Chemical Engineering, please follow the link: http://omicsgroup.com/petrochemistry-chemical-engineering-conference-2014/.